Ritta Martin, Glenn County RCD Program Coordinator, teaching 4th graders about the importance of worms at the Pathways to Nature Field trip in March 2018. The Glenn County Resource Conservation District (GCRCD) has been reaching out to future conservationists for over a decade with the RCD Connects with Kids program and, for the last two years, has partnered with USDA Natural Resources Conservation Service to help students focus in on soil health. In January, GCRCD’s Soil Health Coordinator was invited to be a judge at the Glenn County Science Fair, which was a profoundly enlightening exploration of what students are learning county-wide. 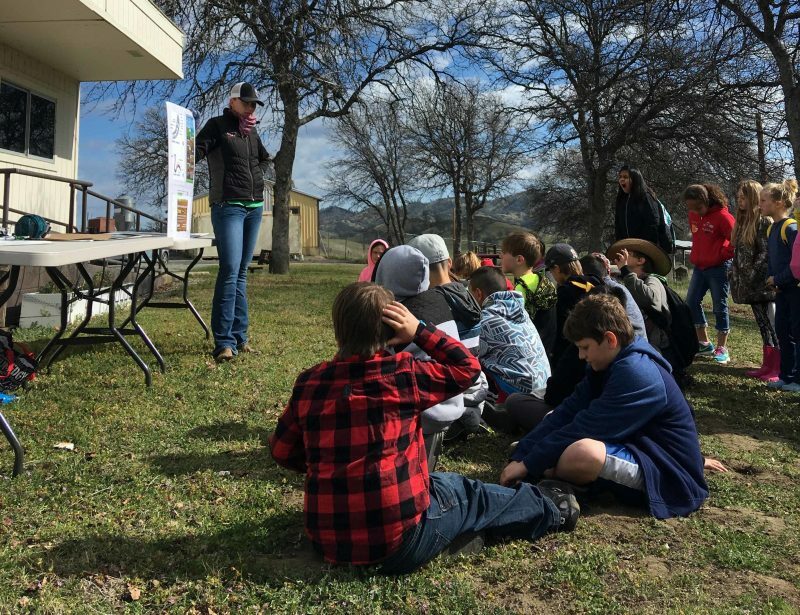 In March, GCRCD staffers Ritta Martin and Melina Watts taught soil health at the Pathways to Nature event in Elk Creek to fifth graders from four local schools, reaching approximately 100 students. The soil health coordinator was invited to participate in the annual Career Day at the Glenn County Fairground where the entire eighth grade student body from every school in the county joined up to meet with over 80 different adults, each representing his or her own profession and industry (in the unbiased opinion of the GCRCD staff, this exceptional event should be a model for every school district across the State of California.). At the Glenn County RCD table, students learned about soil health, conservation and sustainable agriculture as well as career paths in these arenas, while a number of kids revealed exceptional knowledge of soil and agricultural conditions. Finally, the GCRCD soil health coordinator taught about the web of life and how it ties into soil health at the Willows Public Library this summer to a group of about 25 community members of all ages — from babies to toddlers to elementary school aged children and mothers and nannies — and the diversity of questions made for an intriguing reconsideration of what makes up healthy soils. Taking the long view, for over a decade, the RCD Connects with Kids program has been providing meaningful conservation education activities for local youth, focusing on enhancing classroom and youth group activities. Through this program, GCRCD is active in Future Farmers of America competitions, offers financial awards for the Glenn County STEM Showcase (Science Fair), offers financial awards for the Annual High School Speak-Off Contest and offers sponsorships to the Range & Natural Resources Camp. Via a partnership with Willows High School, RCD Connects with Kids assists students in making and marketing nest habitats for owls, bats and song birds. Over 350 boxes have been built, sold and placed across the landscape. In a partnership with Elk Creek High School, RCD Connects with Kids has assisted students in making, marketing and helping to place wildlife escape ramps for livestock troughs, and over 25 ramps have been sold. This year the GCRCD sponsored Glenn County high school student Joseph Silveira to attend the Range & Natural Resources Camp. Afterwards, he gave an excellent presentation about his experiences to the GCRCD Board of Directors and Glenn County Farm Bureau. The stream restoration segment of the course resonated with him for a long time after the presentation, as did the experience of spending a number of days away from his family with new peers while being in a different ecosystem with coastal forests and adjacent to the Pacific Ocean. In order to grow the RCD Connects with Kids program, GCRCD’s board and staff recognized that a community needs assessment in Glenn County would help determine what type(s) of future programming would be most valuable and beneficial to their constituents. They have pulled together the Glenn County Agriculture and Conservation Education Committee, which included a mix of teachers, conservation educators, agriculture educators, and the director of the new Glenn County STEM program, Darren Massa. What the committee found: there is a passionate shared interest in creating meaningful conservation and agricultural programming that would get local students to offsite field trips in agricultural settings and into Glenn County’s natural resource areas, such as Black Butte Lake and the Sacramento National Wildlife Refuge, which is limited by a real lack of funding. There is also a deep interest in creating collaborative conservation and agricultural programming designed for students during afterschool and summer hours. Glenn County RCD continues to explore funding to make these goals a reality for the youth in their community. The long-running (so to speak) annual fundraiser for RCD Connects with Kids programming continues to thrive: at the 2018 Run Your Tail Off event, overall attendance was estimated at 140+ with volunteers and emergency personal for safety. The sponsor income raised through the fundraiser increased $777 from 2017, with a total gross income of $9,376. Including volunteer and in-kind match, the Glenn County RCD estimates the that the event raised approximately $15,000. In addition, the estimated community reach was 5,000+ community members from Redding to Chico to Gridley to Colusa and all of Glenn County through press releases, postcard distribution of the fundraiser, and advertisements, including Facebook. There’s a beautiful video of the women’s grand prize winner from 2017 here: Shannon won the Run Your Tail Off 10k. For those looking to join the fun, there will be a separate category for runners from rival, or rather, neighbor RCDs. The “Run Your Tail Off… through the Watershed” 5K/10K – 8th Annual Saturday, April 13, 2019.